Francis Howell High School has been the site of my spring semester clinical rotation, and my experience here has been nothing short of amazing. I’ve been able to have countless positive interactions with all the athletes, coaches, and staff. Since Francis Howell is such a large school with numerous sports and many athletes, there is rarely a dull moment. Our day here starts at 2 p.m. The work begins as we prepare the athletic training room for the day just twenty minutes before the athletes start coming in after school. We generally have a steady stream of athletes each day going through rehabilitation exercises of which I get to be heavily involved with. We’ll also see athletes that need to be evaluated from an injury that may be either lingering or acquired during the previous practice. My preceptor has integrated me very well with all the rehabs going on to help me get more exposure. She also allows me to be the first one to evaluate an injured athlete before she examines them and we compare our findings. This has allowed me to gain immense knowledge in both the rehabilitation and assessment fields, and to gain more confidence in my skills. 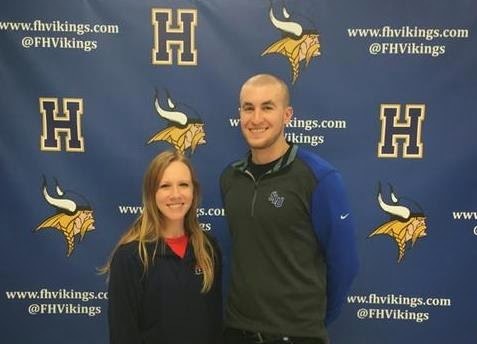 The biggest thing that has made my time here at Francis Howell so great has been my preceptor Ruth Young, ATC. She has been an extraordinary preceptor that is always willing to teach me new things and answer my questions, and she does so in such a thorough way that I feel like I’m learning what I wanted to and then some. Not only does she teach me so many new things, but she encourages me to talk to her about what I’m learning in class so that maybe she can learn something new or pick up something she can use with her athletes. Ruth and I work very well together which not only helps add to an already great learning environment for me, but helps things to run even more smoothly in the athletic training room. She has been nothing short of incredible, and words cannot justify just how great and helpful she has been, or how thankful I have been to have her as my preceptor. I have been very grateful for my time at Francis Howell High School this semester, and it has provided me with an excellent clinical experience this semester. JBS – A welcoming family to SLU AT Students!